Future Group, which has one of the largest chain of retail super-shops in India under Big Bazaar brand, have now launched a unique franchisee based direct selling business model called Big Bazaar Direct as per Business Standard. Big Bazaar Direct was first launched in Nagpur three weeks back on pilot basis and will be extended across the country in next couple of months. 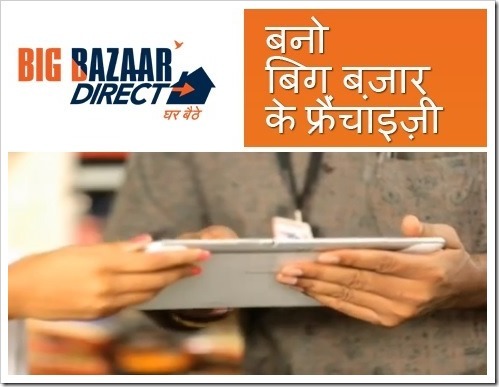 Here is how the model works – Big Bazaar Direct appoints direct small franchisees, who will be given a tablet called “Big Bazaar Direct tablet”. The tablet will carry over 1000 deals from their Big Bazar retail stores. These tablets will essentially serve the franchisees as their store front-end. The customer can look up the catalogue of products available on these tablets and place their orders with the franchisee. Once the order is placed on the tablet, customers will receive SMS confirmation upon which they will need to make the payment to franchisees. Customers are expected to receive their orders within 3-7 days from the date of the order. Franchisee will get paid for every order placed through them, while the logistics of delivery will be taken care by the company. The company plans to bring down the delivery timeline to 24 hours in metro cities, while 48 hours in smaller cities. Big Bazar Direct is expecting to have over 1 Lakh franchisee tie-ups over next 2 years. INR 1,00,000/- Non interest bearing refundable security deposit. INR 1,00,000/- as initial advance which is to be used for placing order. INR 1,00,000/- Set Up charges for Big Bazaar Direct Tablet, initial branding, one year training, launch material etc. We think that success of franchisee model that Big Bazaar Direct is banking on depends on how many franchisees they are able to rope in. If they have even half of expected 1 Lakh franchisee, it should really work out great. However, getting to that number will be quite difficult for Big Bazar given the steep upfront franchisee fee of Rs. 3 Lakh. For a average person, shelling out that kind of money will be a huge task – they should have made it easier for people to take the franchisee with lesser initial investment. Not considering the investment factor, we think this model would have definitely appealed to small shopkeepers and individuals who could extend their services by offering Big Bazaar catalogue of products to their existing customers. We will need to wait and see as to how many people actually join this unique business model proposed by Future Group. "Big Bazaar Direct, A Franchisee Based Direct Selling Platform From Future Group", 5 out of 5 based on 1 ratings. I am Nikhil Kumar Saini from Roorkee(Uttarakand ). I want get big bazaar franchise at Roorkee dist-Haridware(Uttarakand ). So could you please send me entire details of buying your franchise? And also send all requirements at my email id. I am interested to open a Big bazaar in my locality in Balangir. Can I get the contact for further details. I am interested in Big bazar, please explain how to start . i want to intersted for big bazar franchise in uttarakhand . pls update me regarding this …. I want to know that it is possible to get franchise of Big Bazar in 5 lack INR amount in Hisar City, Haryana. And what is the Documentation & requirement to get franchise of same. I came to know that you are looking for building on rent for opening BIG BAZAAR at Malda west Bengal. I am having a building around 10000 sq. Ft with G + 3 and another floor under construction it is near to the current Malda private and state bus stand. It is on the NH 34 . beside attached building is state bank of India Jadupur branch.we have already has SBI ATM counter.rate negotiable as per market rate. Hy this is vikram kumar. I’m residing at Tripura in north east.I m very much interested to take a franchisee of big bazaar direct.place name is dhummacherra. Revenue making place.so can u please tell me what are the conditions and how much place is required for store.u can direct contact on 07085773282. Hello sir/madam, am dheerendra pratap singh from sant ravidas nagar bhadohi(uttar pradesh). Am interested in big bazaar franchise. So could u please send me entire details of buying your franchise? And also the requirements. I am interested to open kirana bazar in Pratapgarh (U.P) so please give your contact number by which the further process should be done between us to open frenchise. Dear sir I am interested to franchise in big bazar for adilabad district telangana if you wish to give me please send me the formalities thank you. I need a franchise. can anyone help me and could anyone provide me the contact numbers for the franchise. we like to start a bigbazar direct franchise , so like to know the minimum space requirement and other terms and conditions and whether we can add dress materials or not. I want to open a big bazaar store in any north east state like shillong, dimapur or guwhati.I can arrange for the location.if you can please help me out to do bussiness with big bazaar it would be of great profit for your company as well. I m ankita from north goa want to start a big bazaar franchise( fbb store). It is my dream and very much interested to run business. kindly mail me the details to start fbb store. i m a retailer in delhi,janak puri,having a medical store in residential place,so pl.help me to join this BIG BAZZAR franchaisee option and send me all the details and terms of ur policy in my mail box,or call me @9891089475.ROHIT KALRA. Hello sir/madam, am kiran Kumar from Bellary(Karnataka). Am interested in big bazaar franchise. So could u please send me entire details of buying your franchise? Respected sir;I want to open a BIG BAZAR SHOP. PLEASE TELL ABOUT THE FRENCHISE DETAILS. I WANT TO TAKE FRENCHISE FOR BIG BAZAR SHOP. PLEASE SEND DETAILS ON MY E MAIL ID. THANKS. I am interested for Big Bazar Franchise . Please send me details on my mail & residential address also. depends on three factors: 1. How will a buyer reach these tablet holder ? 2. How much commission does the franchise get per sale? ROI on 3 Lakhs investment. 3. Whats the effort involved in making a sale. I know of a company that tried this exact model in a different domain and failed miserably. send me detail of franchise of big bazaar. 1. How will a buyer reach these tablet holder ? 2. How much commission does the franchise get per sale? ROI on 3 Lakhs investment. 3. Whats the effort involved in making a sale. I know of a company that tried this exact model in a different domain and failed miserably.